Complement : Officers 73, enlisted 294. Armament : One single 5"/38 dual purpose gun mount, one quad 40mm AA gun mount, two dual 40mm AA gun mounts, four dual 20mm AA gun mounts. Two diesel-drive 100Kw 450V A.C., two diesel-drive 200Kw 50V A.C.
Diesel 1,955 Bbls. Gasoline 84,340 Gals. Propulsion: Two General Motors 12-288 diesel engines, single Fairbanks Morse Main Reduction Gear, two shafts, 6,080 shp. 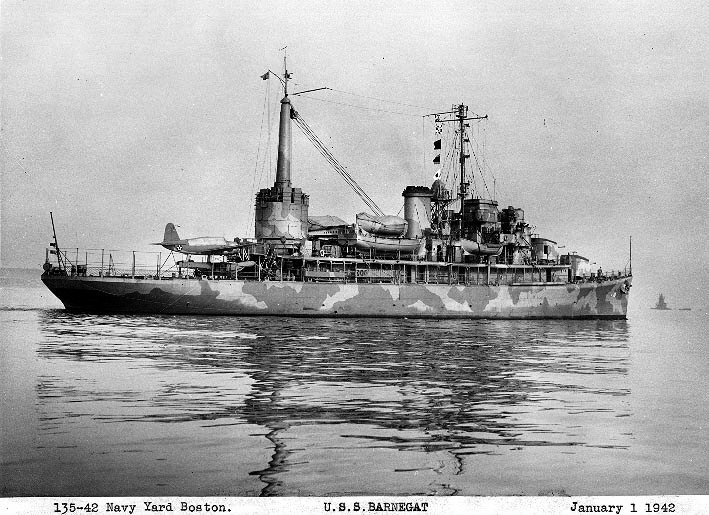 After installation of YG homing equipment, QC sonar, and other gear, Barnegat left Boston on 31 May 1943. She took part briefly in local exercises, then headed south on 6 June 1943. She reached Norfolk, Virginia, on the morning of 7 June 1943, but on 15 June1943 cleared the Virginia Capes for Brazil. 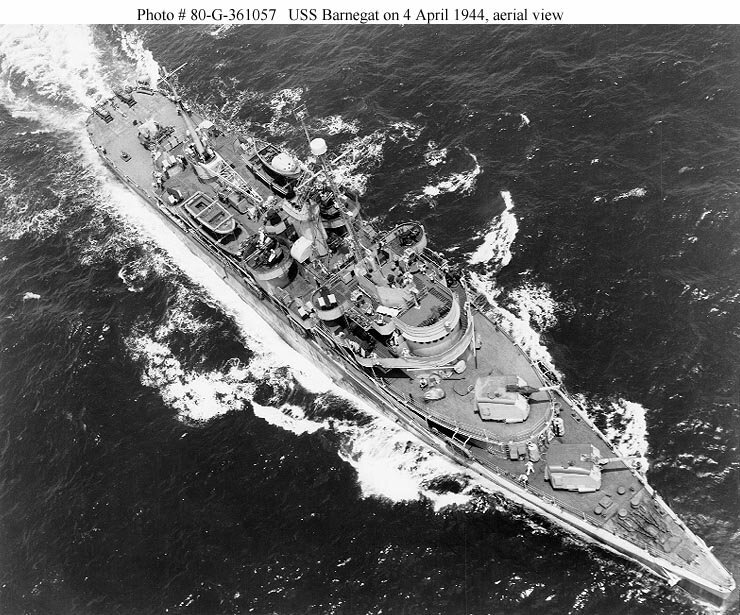 Steaming via Bermuda, Barnegat reached Natal, on Brazil's northeastern coast, on 26 June1943. Reporting for duty with Fleet Air Wing (FAW) 16, Barnegat relieved seaplane tender USS Humboldt (AVP-2) in servicing Admiral Jonas Ingram's United States Fourth Fleet planes assigned to cover convoys from Brazil to Trinidad. Her arrival coincided with the opening shots of a local German submarine "blitz" against coastal shipping; the day before, the German U-boat U-513 had torpedoed the steamer SS Venetia. Underway again on 28 June 1943, Barnegat dropped down the Brazilian coast and moored at Recife, Brazil, on the morning of 29 June 1943 to start yet more repairs alongside destroyer tender USS Melville (AD-2), an old Iceland comrade. Those repairs done, Barnegat made a brief trip north, touching at Natal and Recife before returning south with the tanker SS Gulfport. 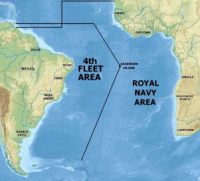 Stopping at Bahia, Brazil, on 9 July 1943, the pair continued south and reached Rio de Janeiro, Brazil, on 13 July 1943. Her presence there having been dictated by the recent rash of sinkings by U-boats in the region, after taking a load of gasoline from Gulfport, Barnegat departed Rio de Janeiro on 17 July 1943 for Florianópolis, Brazil, less than 500 nautical miles (926 kilometers) in a straight-line distance from Rio de Janeiro, as part of the temporary measures to meet the U-boat threat. Two Martin Martin PBM-3C Mariner flying-boat patrol bombers of Patrol Squadron 74 (VP-74) also were sent to Florianapolis. Anchoring on 18 July 1943, Barnegat was ready to receive the two planes when they arrived less than four hours later. Operations commenced on the morning of 19 July 1943. At 07:02 hours, PBM-3C "74-P-5", flown by Lieutenant, junior grade, Roy S. Whitcomb, took off from San Miguel, Florianópolis, on an antisubmarine sweep. 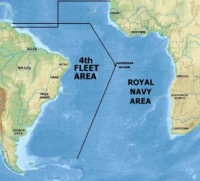 The patrol proceeded uneventfully until the radar operator reported a contact at 13:55 hours. As Whitcomb looked at the "sharp blip" on his own radar scope, the second pilot called his attention to something to starboard. Whitcomb recognized the object as a surfaced U-boat and sent his crew to battle stations. Soon, their quarry, U-513, saw the attacking plane and began to take evasive action. Whitcomb's PBM-3C dropped six depth charges and caught the U-boat in a starboard turn. The U-boat absorbed the full impact of at least two direct hits; two depth charges straddled the submarine and two others struck her deck. Within moments, observers in the Mariner saw "rising boils and [a] brown stain on [the] water...." U-513 was no more. Seeing 15 to 20 men struggling in the oily water, Whitcomb circled the scene and dropped life belts and two life rafts to the U-513 survivors, while informing Barnegat of the kill. Barnegat proceeded swiftly to the scene, arrived there in less than four hours, and began a search. At 19:15 hours, she sighted a life raft with seven men on board and closed to pick them up. The first man came on board at 19:30 hours and the last boarded 20 minutes later. Among them she counted the U-513's 28-year-old commanding officer,Kapitänleutnant Friedrich Guggenberger, the ace awarded the Knight's Cross of the Iron Cross for sinking the British aircraft carrier HMS Ark Royal (91) off Gibraltar in November 1941 as commander of the German submarine U-81. The gathering darkness prevented Barnegat from locating more survivors, and she finally ceased her efforts shortly after midnight. Although she returned then to San Miguel Bay to resume operations, she had not heard the last of U-513. At 11:30 hours on 22 July1943, her other plane, "74-P-7", reported sighting a life raft with survivors on board. Underway shortly after noon, Barnegat proceeded to the scene and at 16:45 hours reached two rafts which had been lashed together. These 18 men -- Chief Engineer Harold Van R. Forest of the recently sunk merchant ship Richard Caswell along with 11 men of her crew and six members of her Naval Armed Guard detachment -- were clinging to the raft. Ironically, Richard Caswell--torpedoed on 16 July 1943 -- had been U-513's last victim. Barnegat returned to San Miguel Bay at 21:59 hours on 22 July 1943 but remained there only overnight, getting underway early on the morning of 23 July 1943 for Rio de Janeiro. Reaching that port at 11:00 hours on 24 July 1943, she was held incommunicado until her prisoners could be transferred to authorities ashore on the morning of 25 July 1943. Once that happened, Barnegat shifted to another berth and disembarked the 18 men from Richard Caswell. Over the next few days, Barnegat remained at Rio de Janeiro. 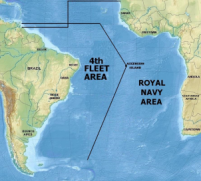 While she was there, Trinidad-bound Convoy JT 3 departed under mixed air cover of both the U.S. Navy and the Brazilian Air Force. Among the planes so tasked, the PBM-3C that had sunk U-513 carried out a routine antisubmarine sweep in advance of the convoy when its radar raised a contact. This proved to be U-199, a Type IXD U-boat on her maiden war patrol and U-513's collaborator in the recent campaign against Allied shipping. U-199 increased speed, and her quartermaster put her helm over to starboard. Confusion reigned below, however, as some of her forward tanks were flooded for an emergency crash dive. The Mariner attacked at 07:18 hours, and U-199 opened fire as soon as the seaplane came into range. The Mariner's machine guns swept the decks, while the plane straddled U-199 with a stick of six bombs that showered the submarine with tons of spray. After landing her two remaining bombs close aboard without sinking the submarine, the plane radioed for assistance. Though badly shaken, U-199 tried to repair her damage and clear the area, but she could not evade her pursuers. A Brazilian Lockheed Hudson bomber responded to the Mariner's call for help and attacked, followed shortly by a Brazilian PBY Catalina, which administered the coup de grace. Informed at 09:58 hours that the U-boat had been sunk, Barnegat hurried to the scene led by another PBM Mariner. She spotted life rafts at 11:38 hours and, by shortly after noon, had picked up five officers and seven enlisted men, among them U-199's commanding officer, 28 year-old Kapitänleutnant Hans Werner Kraus, also a decorated U-boat commander and former executive officer to the U-boat ace Gunther Prien. In the post mortem on the attack, VP-74's commanding officer, Commander Joseph P. Toth, singled out Barnegat, for her “usual good performance...in recovering the survivors” of the sunken U-boat. Once again, Barnegat anchored in the harbor at Rio de Janeiro with her prisoners-of-war held incommunicado until they could be taken ashore. Between 05:20 and 05:40 hours, U-199's men disembarked under heavy guard, en route to the airport and a speedy trip to the United States for a thorough interrogation. 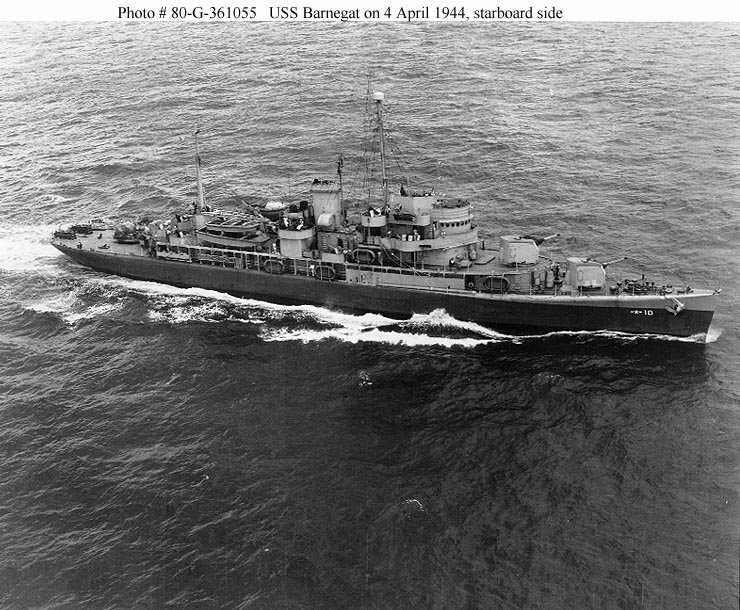 Barnegat remained in Brazilian waters into the spring of 1944, operating at Bahia, Recife, Natal, Fortaleza, Fernando Noronha, Sao Luiz, and Florianópolis. As before, she hauled freigth, transported men and gear, and tended patrol planes of Fleet Air Wing 16 (FAW-16). 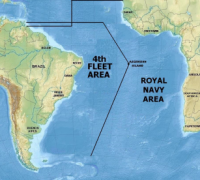 Her only time out of Brazilian waters came when she briefly conducted tending operations at Montevideo, Uruguay, from 13 March1944 to 16 March 1944. Another break in her routine came on 29 November 1943 and 30 November 1943, when she patrolled off the entrance to the harbor at Bahia to cover the arrival of a task group formed around battleship USS Iowa (BB-66) during Iowa's return at the conclusion of her part in transporting President Franklin D. Roosevelt to the Teheran Conference. Barnegat wrapped up her work in Brazilian waters, at Sao Luiz, on 12 May 1944 and departed for the United States that afternoon.